I love embarking on expeditions: being able to discover new places, explore the wilderness, and learn more about the world around us. Yet, expeditions are a lot of work and for an expedition to be successful, a certain degree of planning and teamwork is required. As Howard Tomb says in his essay Expedition Behavior, the Finer Points, “Think of your team - the beautiful machine - first. You are merely a cog in that machine”. Inadequate planning and cooperation often leads to chaos and poor execution of an expedition. JIRP runs for 8 weeks, with an average of 50 people, or cogs, in camp consisting of 32 students, 10 staff, and 6-8 rotating faculty and professors. The larger the expedition, the more planning and gear required. Each individual requires personal gear (sleeping bag, clothes, skis, etc. ), fuel, food, and bunk space. As the quantity of individuals increases, not only does the quantity of supplies increase, but so does the amount of people needed to support and help make the expedition run. It becomes imperative that expedition logistics and teamwork be running smoothly to prevent falling into disarray. Here’s a look into how our little community resists falling into such chaos through logistics, flexibility in the face of weather, and teamwork. JIRP’s organization, leadership, and staff played a vital role in helping the JIRP machine run smoothly as we traversed across the Juneau Icefield. There were four main pieces that make up the bulk of the logistics concerns: food, fuel, machinery, and movements. Food and fuel were perhaps the easiest to understand. Food was of utmost importance in keeping us all fed, healthy, focused and enthusiastic. We used fuel to cook food, run the generator for lectures, and power the snowmobiles. Snowmobiles (known locally as “snow machines”), some of our most important machines, went out in the field almost every day to help the GPS Survey group complete transects of the glacier. They were also used for hauling supplies (tents, food, scientific equipment) out to temporary base camps for overnight scientific excursions. In addition to the smaller snowmobiles, a trusty old Thiokol (snow cat) towed out-of-commission snowmobiles and heavy sled loads up the steep slope back to camp. The fourth part of logistics, movements, might be the hardest component to understand for those readers who have not been up on the icefield. During our expedition, we slowly traversed 90 miles from established base camp to base camp across the Juneau Icefield from Juneau, Alaska to Atlin, British Columbia. Overall, this required movement of people, equipment, food, and fuel. When it came to organizing the traverse, the field staff had to consider: forming trail parties to go to the next camp, time needed for research, available camp space, and significant time just for opening and closing camps. Luckily, much of life on the icefield was intertwined with helicopter support. They brought us food, fuel, and mail and took away our waste metal and outgoing mail. In addition, new faculty arrived, and exiting faculty left on the helicopters. Helicopters also helped transport gear and scientific equipment from camp to camp when snowmobile transportation was limited due to crevasses and topography. 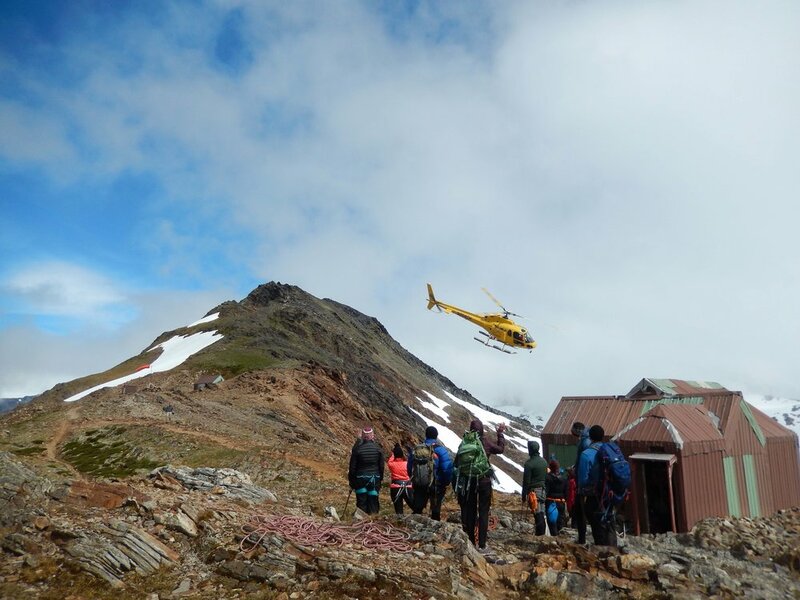 Coastal Helicopter bringing us new supplies and personnel at Camp 17. Photo by Annie Zaccarin. However, a tricky part of running logistics and making all the pieces fit together was flexibility in the face of weather. So much of what we did relied on either going out in the field to conduct research or having helicopter flights arrive on time. When bad weather drifted in and camp was surrounded by a white out, research was delayed without new faculty arriving, fresh food could not be flown in, and weather-dependent field work had to be put off. While this may seem frustrating to those of you reading back home, we JIRPers are resilient folks who always found ways of making the most of any weather that came our way. The role of overseeing all of these components fell on our field staff and Juneau staff. It could very easily be argued that while everyone on the icefield were the engine and the heart and soul of the program, the expertly-run logistics, by the Juneau and field staff, was the motherboard that kept the expedition going. While staff kept the big picture and organization in perspective, all expedition members were key cogs in making the expedition machine run smoothly through teamwork and cooperation. Imagine having all 50 expedition members cook their own meals or clean the outhouses; not very practical. Within the camp, the camp manager assigned cook teams every day, and everyone pitched in on other camp chores and maintenance tasks every morning. Typical chores ranged from maintaining our makeshift snow-fridge, to refilling fuel barrels, or to touching up paint around camp. Although some of the chores were intimidating at first, such as figuring portion sizes for over 50 people, eventually we grew in learning not only how to complete each chore, but also each one’s importance in maintaining camp life. An important lesson I learned during cook crew was how to make and keep gallons of coffee ready for the never-ending cups needing refilling throughout the day. While these small tasks definitely helped keep camp from falling into chaos and disorder, less obvious forms of teamwork and community were similarly instrumental in helping our community come together. We saw teamwork in the staff member that helped you tape up your blisters, in the faculty who worked in challenging conditions to impart their knowledge, in the friend that slowed down to ski with you, in the rope team that arrested your fall, and in the community that became a family. None of us would have been as successful up there on the icefield without that community around us. Every day, as I looked around, I saw our friendships deepen, our team grow stronger, and our community turn into its own 50-person family isolated up on our little nunatak. Our community came together as seen through the cooks that got excited to serve new culinary creations, everyone’s genuine interest in each other’s research projects, and our willingness to share dry clothing. It’s amazing how these all helped contribute to the positive, pleasant, and productive environment whatever the circumstances we were facing on the icefield. In the end, whether we were student, field staff, faculty, or Juneau staff, we all had a role to play in helping make the JIRP machine run smoothly and continue to be the remarkable program that it is. I am ever thankful for getting to be part of the amazing community that is JIRP, and all of the new found friends (students, staff, and faculty) that were instrumental in making the community and experience incredible. Thank you to Newt for providing me with some of the insight needed for this blog post. Coming together over dinner at Camp 10 to enjoy the view and each other's company. Photo by Annie Zaccarin.